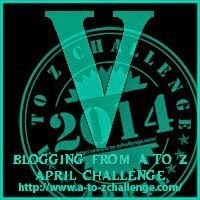 The Victoria and Albert Museum (abbreviated to the V&A) is the world’s largest museum of decorative arts and design. It houses a permanent collection of over 4.5 million objects. The museum was founded in 1852 and named after Queen Victoria and Prince Albert. It is located in the Brompton district of the Royal Borough of Kensington and Chelsea which is an area that is associated especially with Prince Albert because of the many major cultural institutions he was associated with. 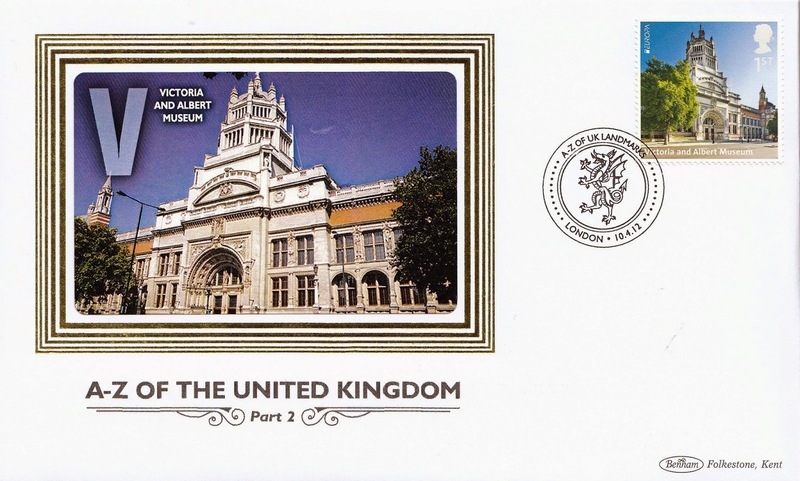 Entrance to the museum, like other national British museums, has been free since 2001. 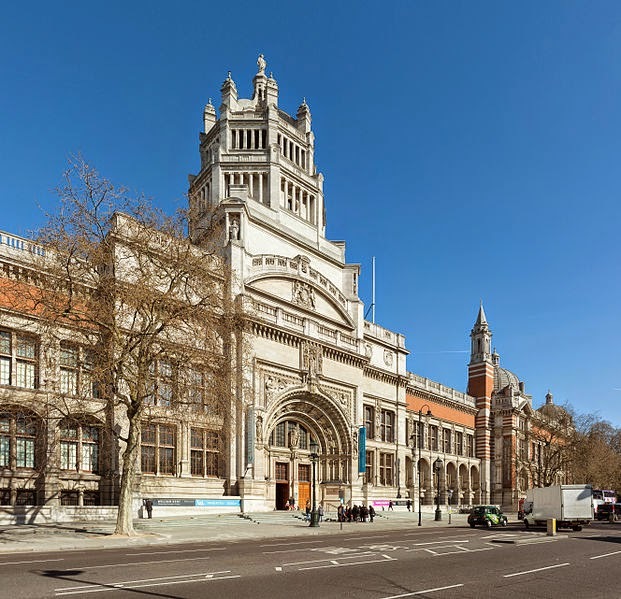 The V&A extends over 12.5 acres (51,000m2) and has 145 galleries. Its collection spans 5,000 years of art, from ancient time to the present day. The museum owns the world’s largest collection of post-classical sculpture with the holdings of Italian Renaissance items being the largest outside Italy. 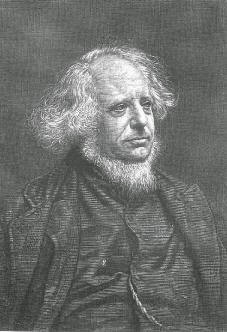 Henry Cole was the museum’s first director who had been involved in the planning of the Great Exhibition in 1851. Several of the exhibits from the Exhibition were purchased to form the nucleus of the museum. 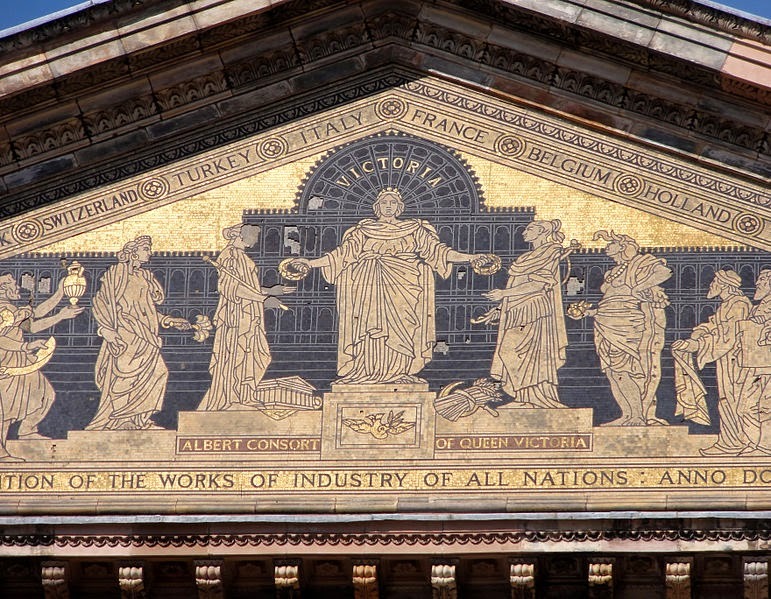 It was first known as the Museum of Manufactures opening in May 1852 at Marlborough House but by September had been transferred to Somerset House, the collections covered by applied art and science. In February 1854 discussions were underway to transfer the museum to the current site and it was renamed as the South Kensington Museum. In 1855 the German architect Gottfried Semper produced a design for the museum which was rejected as being too expensive. The site was occupied by Brompton Park House which was extended to include the first refreshment rooms in 1857, the museum being the first in the world to provide such a facility. Queen Victoria officially opened the building on 22 June 1857 and the following year late night openings were introduced made possible by the introduction of gas lighting to enable, in the words of Cole, hours that were convenient to the working class which was linked to use the collections of both applied art and science as educational resources to help boost productive industry. The laying of the foundation stone of the Aston Webb building (to the left of the main entrance) on 17 May 1899was the last official public appearance by Queen Victoria. It was during this ceremony that the change of name from the South Kensington Museum to the Victoria and Albert Museum was made public. In 1939 on the outbreak of World War II, most of the collection was sent to a quarry in Wiltshire, to Montacute House in Somerset, or to a tunnel near Aldwych tube station with larger items remaining in situ, sand-bagged and bricked in. Between 1941 and 1944 some galleries were used as a school for children evacuated from Gibraltar. The South Court became a canteen, first for the Royal Air Force and later for Bomb Damage Repair Squads. 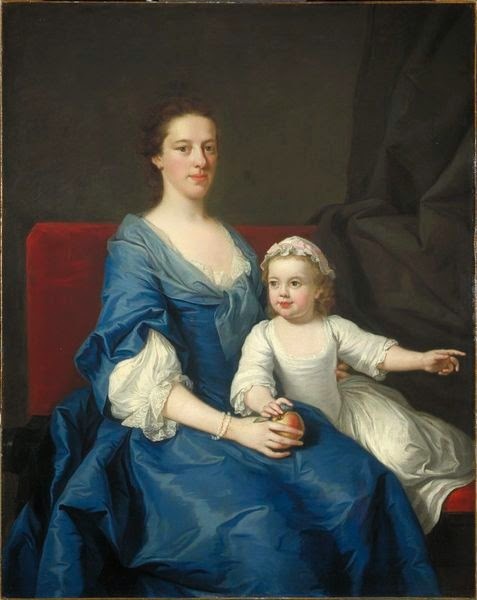 The portrait shows an unknown woman and child, seated on a settee. The woman is holding an apple, which the child touches with its right hand while appearing to point at something beyond the frame with its left. The child’s dress and the pink ribbon on its cap do not necessarily indicate a girl. Until the 1920s, it was the custom for boys to wear dresses until they were ‘breeched’ (given their first pair of trousers), sometimes as late as eight or nine years old. The identification of pink with girls and blue with boys, mainly in Europe and the United States, did not take hold until the early 20th century and is of uncertain origin. Protecting such treasures in wartime must have been a daunting task. You would think more personal and practical matters of government would take precedence. But without art, we have no soul. Your explanation of the child's dress is quite interesting. I was studying an old photo and there was a child in a plaid dress -- it took me awhile to realize it was a boy.